The hardest part is actually collecting the apples. Small boys and pocket money are a good combination! We do an average of 3 presses per year, each press being a good 3 barrowloads of apples, and this for around 200L of bottled cider and a good volume of pasteurised apple juice. Our apple juice has to be diluted 1:1 with water since it is very sweet and syrup-like otherwise. We pasteurise the concentrated juice in 1.5L Kilner-type jars, in the same way that we pasteurise our milk, heating the jars in water, on the kitchen stove, in a large metal pasteurising container, at 80C for 30min (compared with 65C for our milk). The level of alcohol in the final product is directly dependent on the initial sugar level, which is in turn heavily affected by the weather. E.g. three years ago we had a very dry but sunny summer, resulting in a harvest of teeny but very sweet apples, for a final theoretical alcohol content of around 6-7%! 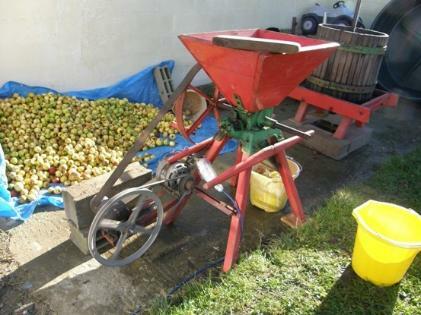 You see here our softwood scratter that works very well to smash up the apples, maximising the amount of juice. In the background of the top picture you can see the oak press, and the second picture shows the press in action, with juice coming out in full flow! This juice tastes like nectar, is highly addictive and concentrated and not to be over-indulged in :). We collect the juice into clean buckets, and then transfer it to clean 80L plastic containers. Sorry all you purists out there, we have tried wooden barrels, but they are hopeless for seeing what is going on, and tend to give an irregular quality, so we decided to take out that particular variable! This year is the first one that we have had a successful fermentation without adding extra brewing or champagne yeast: again purists will tell you that the apples carry their own yeast that will kick-start the process, but in a bad year you can have a "slow" fermentation e.g. not enough surface yeast, which may be washed away by rain. Hence if you want to guarantee a good product, it is probably best to add in extra yeast to manufacturers' instructions. After the first settling out, which seems to take 2-3 days for us, and when the fermentation proper is starting, we transfer the mixture to clean containers, except for the brown foamy surface material and the residual bits of apple in the bottom. You will lose a certain amount of liquid doing this, maybe 10%, but it is worth it to get a cleaner product at the end of the process. We let the fermentation take place over several weeks, incubating our plastic containers on the eco-electricity powered underfloor heating in the kitchen! Hint: good cider smells like good cider by this stage!! We bottle our cider in the kitchen, washing and sterilising the bottles on a low heat in the oven. 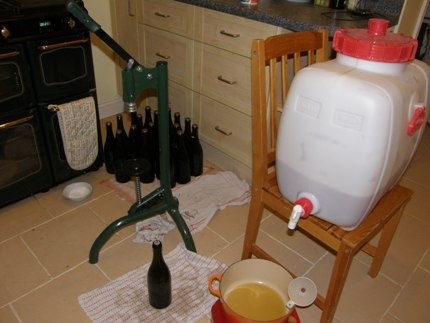 Traditional cider tops or corks are very fiddly, and unless you're an expert it is quite hard to get a good seal with them, so we take the easy route with a mechanical bottle-capper! We fill to within 1cm of the top of the bottle, and then we add a pinch of sugar before capping. So when is your cider good to drink? Well, a fair amount of tasting goes on throughout the process, but we find that it improves for up to a year after bottling! 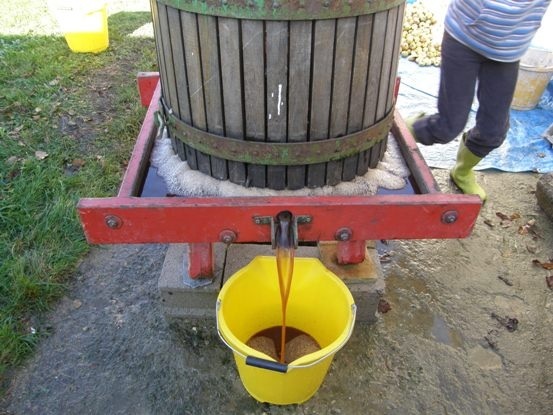 Cider-making is a great activity to do in a group, so if you want to join us and stop loads of apples going to waste, then come on a cider-making weekend at the end of October or beginning November! All Saints - tide is the traditional time for this, or "Toussaint" as it is called here in France.